Photographing Fall Colors. . .
One of my favorite times of the year for photography is coming up. In the fall, the leaves on the trees turn vibrant yellows, oranges, reds and sometimes purple. Each region has its own timing for the fall foliage. Ours is anytime between late September to mid-November. It all depends on the amount of rain, and when the first frost happens. 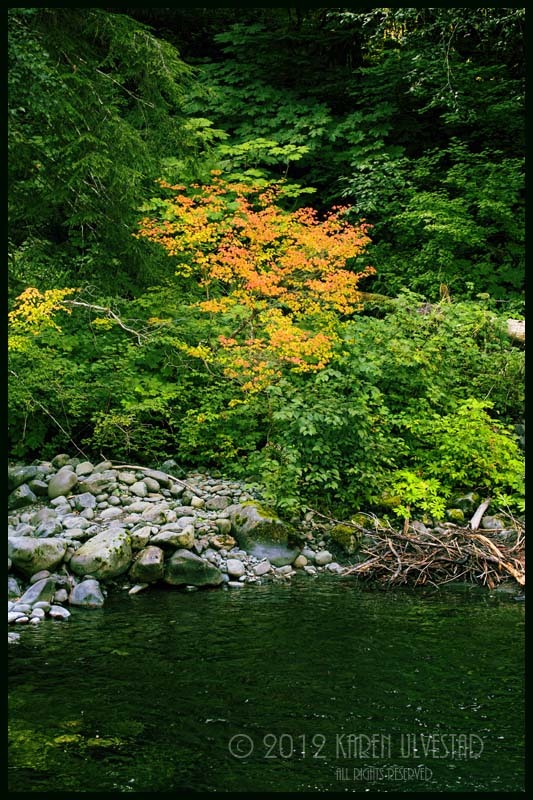 The shot below was taken on Whatcom Creek in northern Washington state. This is a long exposure (3 seconds) on a tripod. The depth of field (Aperture) is f22, for maximum sharpness throughout the photograph. The ISO was 100. The day was over-cast, hence the lack of dark shadows and bright highlights. This can work two ways for a photograph. First, it give even lighting, since the clouds diffuse the sunlight. Second, too much sky showing becomes un-interesting, and can take away from the photograph. In this photo, I cropped out the sky, and focused on the creek, fall foliage and surrounding landscape. This next example deviates from a traditional landscape photograph. 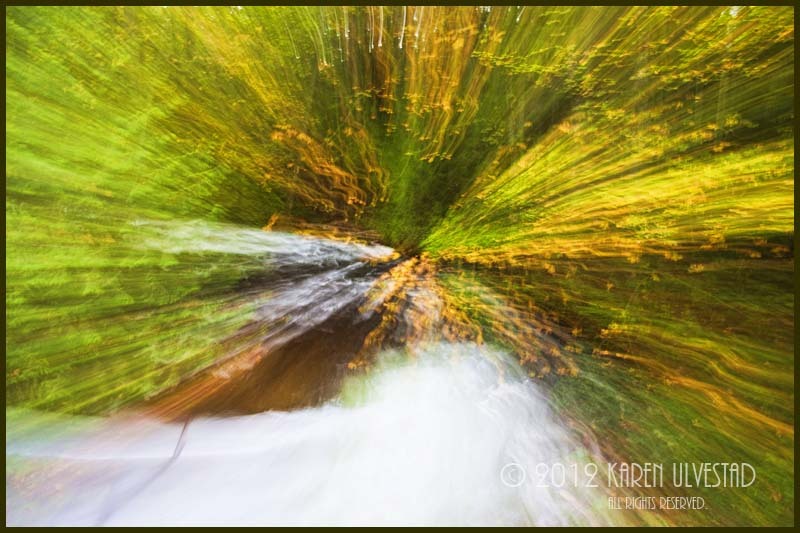 The trees, leaves and stream become an abstract image. This effect is created in the camera by “zooming” the lens. In this case, I used my 17-40mm lens. In this case, I started at 17mm and zoomed to 40mm. This is a 1 second exposure at f10. The ISO was 100. This last photograph was taken on a sunny day. I chose a shaded bend in the river, and cropped out the brightly lit background forest from the frame (in camera). Composition can intensify the fall leaves, by surrounding the tree with a single color. In this case, it is the other green trees that have not turned color yet. I set my camera’s White Balance on Cloudy, which “warms” up the colors in the photograph. A polarizing filter is handy to cut the “glare” from the top of the leaves. This was shot with my 100-400mm lens, at 100mm. The exposure was 1/60 sec, f4.5 and ISO 100. For more information about locations, visit my Examiner.com articles, and subscribe to my updates. I hope that you have a lot of fun shooting this fall. Have a great time shooting. . . Your photography comes alive, satisfying the senses. 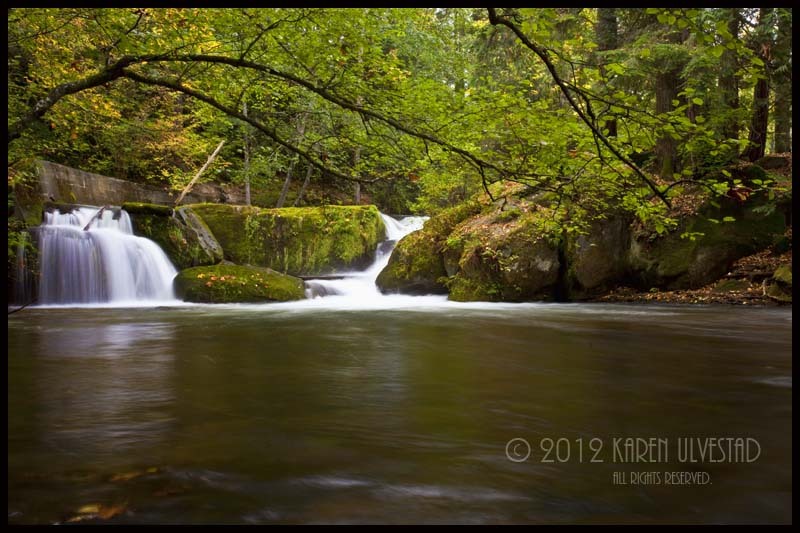 The first image here especially is true of this…I can hear the water spilling over the rocks, feel the coolness and smell the earth of the woodlands.